A Gothic tower by Wim Delvoye and an oil painting of three heads from Rajasthan by Maqbool Fida Husain are among the stars of this year’s Art Dubai fair, with as much as $45 million worth of contemporary works on sale. The 19-foot (5.8 meter) stainless-steel tower is priced by Galerie Perrotin at 750,000 euros to 850,000 euros ($1.1 million). 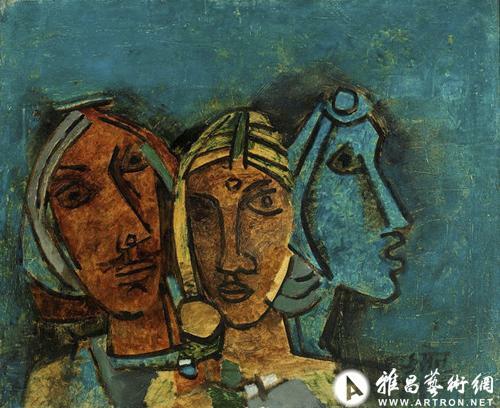 The Husain picture, offered for sale at $150,000 to $200,000, is reserved on the booth of Grosvenor Vadehra. Prices at the event range from $2,000 to $1 million. This year, the sixth edition of the fair has more works from East Asia as it expands its reach beyond the Middle East, North Africa and South Asia. About 90 percent of the 81 galleries that exhibited last year applied to re-attend, and the fair capped exhibitors at 75 to increase quality, according to Antonia Carver, its director. A third of the galleries come from Europe, including Paris- based Galerie Perrotin and Belgium’s Rodolphe Janssen. Another third come from South Asia and the Middle East, and the rest from the U.S. and East Asia. Art Dubai received more than 20,000 visitors and more than 40 museum groups last year. The United Arab Emirates city is the nucleus of the region’s art scene, according to gallerists and collectors. Dubai has more than 50 galleries of its own, with another four opening this year, including second branches of galleries in Lebanon and Pakistan. This year, Art Dubai is taking 65 museum groups -- including the Aspen Art Museum, Metropolitan Museum of Art, and British Museum -- to Qatar as part of a week-long art discussion. Qatar, the world’s biggest exporter of liquefied natural gas, is using its wealth to become a global art player. Last year, Qatar bought Paul Cezanne’s painting “The Card Players” for $250 million, the most paid for a work of art, Vanity Fair magazine reported. Sheikha Mayassa bint Hamad Al Thani, daughter of Qatar’s Emir and Chairwoman of the Qatar Museums Authority, was named the art world’s most influential person by Art & Auction magazine in November. The QMA is presenting Takashi Murakami’s and Louise Bourgeois’s first solo exhibitions in the Middle East, and has a touring show from the Los Angeles County Museum of Art entitled “Gifts of the Sultan: The Arts of Giving at the Islamic Courts” to coincide with Art Dubai. The fair runs through March 24.